Sans Link-a franca, the cards will be torn asunder: and then they shall be free. The Organization has been at work this last week asking ruling questions and revising translations of [CODE OF THE DUELIST]. Here’s our revised spoiler. (1) Once per turn: You can target 1 Attack Position monster your opponent controls; change it to Defense Position, and if you do, monsters you control cannot attack this turn, except to attack the targeted monster, also if a Cyberse-Type monster you control attacks a Defense Position monster this turn, inflict piercing battle damage to your opponent. You can only Special Summon a card(s) with this card’s name once per turn with the way written in this card’s (1)st effect. (1) If you control a Cyberse-Type monster(s), you can Special Summon this card (from your hand). You can only use an effect with this card’s name once per Duel. 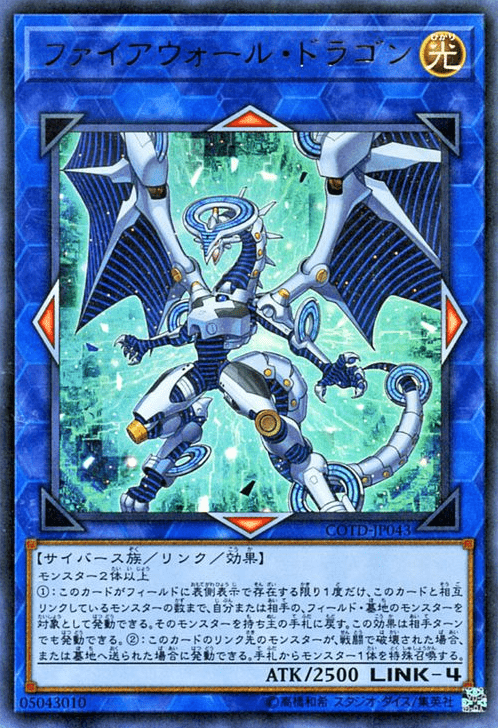 (1) If this card is used as a Material for a Link Summon: You can target 1 other Level 4 or lower Cyberse-Type monster in your Graveyard that was used as Material for that Link Summon; Special Summon it in Defense Position. (1) Cyberse-Type monsters you control gain 300 ATK and DEF, except this card. (2) Once per turn: You can Tribute 1 Cyberse-Type monster, then target 1 face-up monster your opponent controls; destroy that monster. You can only use the (1)st and (2)nd effects with this card’s name once per turn each. (1) If a Cyberse-Type Link Monster(s) in your possession is destroyed by your opponent’s card (by battle or card effect), and this card is in your hand or Graveyard: You can Special Summon this card. (2) You can discard 1 Spell Card, then target 1 Cyberse-Type monster in your Graveyard; Special Summon it, but it cannot attack directly this turn. (1) If this card is added to your hand, except by drawing it: You can Special Summon this card from your hand. (2) This card can attack directly. (3) When this card inflicts battle damage to your opponent: You can target 1 “Trickstar” monster in your Graveyard; add that monster to your hand. (1) During either player’s turn: You can reveal this card in your hand, then target 1 “Trickstar” monster you control, other than “Trickstar Lycorissica”; Special Summon this card, and if you do, return the targeted monster to the hand. (2) Each time a card(s) is added to your opponent’s hand, inflict 200 damage to your opponent for each. (1) When this card is Normal Summoned: You can add 1 “Trickstar” card from your Deck to your hand. (2) Each time your opponent activates a Spell/Trap Card, inflict 200 damage to your opponent immediately after it resolves. (1) During either player’s turn: You can Tribute 1 “Gouki” monster, then target 1 “Gouki” monster you control; for the rest of this turn, it gains ATK equal to the original ATK of the Tributed monster. (2) If this card is sent from the field to the Graveyard: You can add 1 “Gouki” card from your Deck to your hand, except “Gouki Twist Cobra”. (1) When this card is Normal Summoned: You can Special Summon 1 “Gouki” monster from your hand. (2) If this card is sent from the field to the Graveyard: You can add 1 “Gouki” card from your Deck to your hand, except “Gouki Suplex Rex”. (1) If you control no monsters, or all monsters you control are “Gouki” monsters, you can Normal Summon this card without Tributing. (2) If this card is sent from the field to the Graveyard: You can add 1 “Gouki” card from your Deck to your hand, except “Gouki Rising Scorpio”. (1) If your opponent controls no monsters, you can Special Summon this card (from your hand). You can only use an effect with this card’s name once per turn. (1) You can banish this card and 1 Machine-Type monster you control, then target 1 DARK monster in your Graveyard; Special Summon it. (1) Cannot be destroyed by battle with a monster that has a Level lower than or equal to this card’s Level. (2) When your opponent Normal or Special Summons exactly 1 monster that has a Level: You can have that monster lose ATK equal to its Level x 200, and if you do, inflict damage to your opponent equal to the amount lost. This ATK loss lasts for the rest of this turn. (1) You can Tribute 1 “Supreme King Servant Dragon” monster; destroy this card, and if you do, add 1 Pendulum Monster with 1500 or less ATK from your Deck to your hand. (1) You can Tribute 2 “Supreme King Servant Dragon” monsters; Special Summon this card from your hand. (2) If a Pendulum Monster you control battles an opponent’s monster, any battle damage it inflicts to your opponent is doubled. (3) During either player’s Battle Phase: You can Tribute this card; Special Summon, in Defense Position, up to 2 “Supreme King Servant Dragon” / “Supreme King Gate” Pendulum Monsters from your face-up Extra Deck. (1) You can Special Summon this card (from your hand) by Tributing 1 monster with a Predator Counter your opponent controls. (2) If this card is sent from the field to the Graveyard: Place 1 Predator Counter on each monster your opponent controls, and if you do, any of those monsters that are Level 2 or higher become Level 1 as long as they have a Predator Counter. (1) When this card is Normal Summoned: You can Tribute 1 “D/D” monster; Special Summon 1 Level 7 “D/D/D” monster from your Deck. (2) During your Main Phase, if this card is in your Graveyard because it was sent there this turn: You can Fusion Summon 1 Level 8 or higher “D/D/D” Fusion Monster from your Extra Deck, by banishing Fusion Materials listed on it from your Graveyard, including this card. A priestess offering requiem prayers to the Star God. With her ceremonial staff, passed down through the generations, she uses her powers to erect a barrier, protecting the denizens of the forest from the rule of the Jack Knights. She possess divine linking powers so powerful even the protector dragon of the forest is fond of her, but she’s usually a kind girl who cares deeply about her brother and her childhood friend. An honest youth who has equipped himself with the remains of Malwere. Having long since admired the “Star Hero” told in stories around the Celestial Forest since ancient times, he accepted the fairy Ries’ request, and set out on a journey to release the Seven Starrelics with his comrades who have also been gifted by the light. A young man who spends all his time fighting Malwere. Even when the Crawlers living around the forest suddenly went on a rampage, he stood his ground and prevented them from breaching the barrier. (1) During either player’s turn, when a card or effect is activated that targets a monster you control in a Linked State: You can send this card from your hand or face-up from your field to the Graveyard; negate that activation, and if you do, destroy it. (2) You can banish this card from your Graveyard, then target 1 Normal Monster in your Graveyard; Special Summon it in Defense Position to a Link Monster’s Link Point on your field. (2) If this card is in your Graveyard: You can send 1 monster from your hand or field to the Graveyard; add this card from your Graveyard to your hand. You can only use the (2)nd and (3)rd effects with this card’s name once per turn each. (1) If a monster(s) is Special Summoned from the Extra Deck: You can Tribute this card; send that monster(s) to the Graveyard. (2) If this face-up Normal Summoned/Set card leaves the field: You can Special Summon 2 “Stargrail” monsters from your Deck, except “Starrelic – “Stargrail””. (3) During your Main Phase, except the turn this card was sent to the Graveyard: You can banish this card from your Graveyard: Add 1 “Starrelic” card from your Deck to your hand. (1) Once per turn: You can banish 1 “Lightsworn” monster that has a Level from your hand or Graveyard, then target 1 face-up monster on the field; for the rest of this turn, it loses ATK and DEF equal to the banished monster’s Level x 300. (2) Once per turn, if the effect of a “Lightsworn” monster in your possession, except this card’s, is activated: Send the top 2 cards of your Deck to the Graveyard (or your entire Deck, if less than 2). (1) Once per turn, during either player’s turn, when a Spell/Trap effect is activated: You can banish 1 “Lightsworn” monster from your hand or Graveyard, then target 1 face-up Spell/Trap Card on the field; destroy it. (2) Once per turn, if the effect of a “Lightsworn” monster in your possession, except this card’s, is activated: Send the top 3 cards of your Deck to the Graveyard (or your entire Deck, if less than 3). (1) Once per turn: You can banish 1 “Lightsworn” monster from your hand or Graveyard, then target 1 of your banished “Lightsworn” monsters, except “Lumina, Twilightsworn Shaman”; Special Summon it. (1) If this card is Normal Summoned or flipped face-up: You can banish 1 “Lightsworn” monster from your hand or Graveyard; banish 1 card on the field. Must be Special Summoned (from your hand) while 4 or more of your “Lightsworn” monsters with different names are banished, and cannot be Special Summoned by other ways. (1) Once per turn, during either player’s turn: You can pay 1000 LP; shuffle into the Deck(s) all cards that are either banished face-up or in any Graveyard(s), except “Lightsworn” monsters. (2) Once per turn, if the effect of a “Lightsworn” monster in your possession is activated: Send the top 4 cards of your Deck to the Graveyard (or your entire Deck, if less than 4). (1) You can shuffle this card on the field into the Deck; Special Summon, from your Deck to Link Monsters’ Link Points on your field, any number of monsters whose total Levels equal 6, except “Rescue Ferret”, but the Summoned monsters have their effects negated (if any), also destroy them during the End Phase. (1) When this card is Normal Summoned: You can add 1 “Traptrix” monster from your Deck to your hand. (2) Unaffected by the effects of “Hole” Normal Trap Cards. (3) Once per turn, during either player’s turn: You can target 1 Set Spell/Trap Card you control; return that target to the hand, then you can Set 1 Spell/Trap Card from your hand. (1) When this card is Normal Summoned: You can target 1 Level 4 or lower monster in your Graveyard; Special Summon it in Defense Position, but it has its effects negated (if any). (1) You can banish up to 3 Spell/Trap Cards from your Graveyard, face-down; Special Summon from your Deck 1 Normal Monster whose Level equals that number. (1) If this card in its owner’s possession is destroyed by an opponent’s card (by battle or card effect): You can target 1 Level 4 or lower monster in your Graveyard, except “Zombiena”; Special Summon it. (1) If this card battles a monster in an Extra Monster Zone, this card gains 800 ATK and DEF during the Damage Step only. Must be Special Summoned (from your hand) while all monsters in your Graveyard (min. 5) have different names from each other, and cannot be Special Summoned by other ways. (1) Once per turn, during either player’s turn: You can send the top 3 cards of your Deck to the Graveyard; destroy 1 card on the field. All monsters in your Graveyard (min. 2) must have different names from each other to activate and to resolve this effect. (1) You can Special Summon this card (from your hand) by paying 3000 LP. (2) If this card was Special Summoned by the method written in its (1)st effect, and it is destroyed by an opponent’s card (by battle or card effect) while its owner controls it: Gain 5000 LP. (1) When you take battle damage from an opponent’s attacking monster: You can Special Summon this card from your hand, then you can Special Summon 1 monster from your hand whose ATK is equal to or less than the damage you took. Must be either Fusion Summoned, or Special Summoned by Tributing the above monsters (in which case you do not use “Polymerization”), and cannot be Special Summoned by other ways. (1) Once per turn: You can target 1 monster on the field or in any Graveyard(s), except this card; until the End Phase, this card’s name becomes that monster’s original name, and replace this effect with that monster’s original effects (if any), also, for the rest of this turn, if a monster you control attacks a Defense Position monster, inflict piercing battle damage to your opponent. (1) If this card is Synchro Summoned: You can destroy all face-up monsters your opponent controls. (2) Once per turn, if this card battles an opponent’s monster, before damage calculation: You can destroy that monster, and if you do, inflict damage to your opponent equal to its original ATK. (3) If this card is in your Graveyard: You can Tribute 2 “Supreme King Servant Dragon” monsters; Special Summon this card from your Graveyard. (1) While 3 or more “D/D/D” monsters are on the field, this card gains 3000 ATK. (2) If another “D/D” monster(s) is Normal or Special Summoned to your field, while you control this face-up card (except during the Damage Step): You can target 1 “D/D” monster in your Graveyard; Special Summon it. (1) Once per turn, if this card battles an opponent’s monster, before damage calculation: You can detach 1 Xyz Material from this card; have that opponent’s monster’s ATK become 0, and if you do, this card gains ATK equal to that monster’s original ATK. These changes last for the rest of this turn. (2) During either player’s Battle Phase: You can return this card to the Extra Deck: Special Summon, in Defense Position, up to 2 “Supreme King Servant Dragon” / “Supreme King Gate” Pendulum Monsters from your face-up Extra Deck. (1) During either player’s turn, when a Spell/Trap Card or monster effect is activated that includes an effect that Special Summons: You can detach 1 Xyz Material from this card; negate that activation, and if you do, destroy it, then you can have both this card and 1 other “D/D” monster you control gain 1800 ATK for the rest of this turn. (2) If this card is sent from the field to the Graveyard: You can add 1 “Dark Contract” card from your Deck to your hand. (1) During either player’s turn: You can target monsters on the field and/or in any Graveyard(s), up to the number of monsters in Mutual Links with this card; return those monsters to the hand. This effect can only be used once while this card is face-up on the field. (2) If a monster(s) in this card’s Link Point(s) is destroyed by battle or sent to the Graveyard: You can Special Summon 1 monster from your hand. (1) Each time a “Trickstar” monster(s) is Normal or Special Summoned to this card’s Link Point(s), inflict 200 damage to your opponent. (2) “Trickstar” monsters in this card’s Link Points cannot be destroyed by battle or card effects. (3) Each time your opponent takes damage from a “Trickstar” monster effect: For the rest of this turn, this card gains ATK equal to that damage. (1) Each monster on the field loses ATK equal to its own original DEF. (2) If this card would be destroyed by battle or card effect, you can destroy 1 monster you control in this card’s Link Point instead. (1) If another monster is Special Summoned to the Link Point(s) of a Link Monster(s) that is already on the field, while you control this face-up card: Destroy all monsters in both players’ Main Monster Zones, also monsters you control cannot attack for the rest of this turn, except this card. (2) If this card attacks an opponent’s monster, after damage calculation: Inflict damage to your opponent equal to that opponent’s monster’s original ATK. (2) If this card battles an opponent’s monster in this card’s Link Point, at the start of the Damage Step: You can destroy that opponent’s monster. (3) If this card is sent from the field to the Graveyard: You can Special Summon 1 “Stargrail” monster from your hand. (1) While this card is in a Linked State, it cannot be destroyed by battle or card effects, also it cannot be targeted by your opponent’s card effects. (2) If a monster(s) in this card’s Link Point(s) would be destroyed by a card effect, you can send this card to the Graveyard instead. (1) This card gains 300 ATK for each “Starrelic” monster with a different name in your Graveyard. (2) You can Tribute 1 “Stargrail” monster in one of this card’s Link Points, then target 1 monster in your Graveyard, except the monster Tributed to activate this effect; Special Summon it to one of this card’s Link Points on your field. (1) If this card is Link Summoned: Draw 1 card for each “Stargrail” monster in this card’s Link Points. (2) Once per turn: You can send 2 cards on the field (1 from each player’s side of the field) to the Graveyard. (1) EARTH monsters on the field gain 500 ATK and DEF. WIND monsters on the field lose 400 ATK and DEF. (2) If this card is destroyed by battle or card effect: You can target 1 EARTH monster in your Graveyard; add that monster to your hand. (1) When this card resolves, you can add 1 “Trickstar” monster from your Deck to your hand. (2) Once per turn: You can target 1 Set card in your opponent’s Spell & Trap Zone; until the End Phase, that Set card cannot be activated while this card is in the Field Zone, also, during the End Phase, your opponent must either activate it or send it to the Graveyard. (3) Each time a “Trickstar” monster inflicts battle or effect damage to your opponent, inflict 200 damage to your opponent. (1) Target 2 “Gouki” monsters in your Graveyard that have different Levels from each other; Special Summon them in Defense Position. Equip only to a Machine-Type monster. (1) When the equipped monster destroys an opponent’s monster by its attack: You can activate this effect; it can make a second attack during this Battle Phase. During the turn you activate this effect, monsters you control cannot attack, except the equipped monster. During the turn you activate this card, you cannot Normal or Special Summon monsters, except with this card’s effect, and monsters you control cannot attack. (1) Special Summon, from your face-up Extra Deck, as many Pendulum Monsters as possible, but they have their effects negated (if any), then your opponent gains LP equal to their combined original ATK. (2) Once per turn, if a face-up “Stargrail” monster(s) you control leaves the field because of your opponent’s card effect, or is destroyed by battle: You can target 1 “Stargrail” monster in your Graveyard; Special Summon it in Defense Position. (1) Target 2 “Stargrail” monsters in your Graveyard with different names from each other; add those monsters to your hand. (2) If a Link Monster(s) you control in a Linked State would be destroyed by battle, you can banish this card from your Graveyard instead. (1) Target 1 “Lightsworn” monster in your Graveyard; add that monster to your hand, then banish cards from the top of your Deck equal to its original Level (or your entire Deck, if less than its original Level). (1) If you control “Punishment Dragon”: Target 1 “Judgment Dragon” in your Graveyard; add that monster to your hand, then send the top 4 cards of your Deck to the Graveyard (or your entire Deck, if less than 4). (2) If this card is sent from the Deck to the Graveyard by a “Lightsworn” monster effect: You can target 1 “Punishment Dragon” in your Graveyard; add that monster to your hand, then banish the top 4 cards of your Deck (or your entire Deck, if less than 4). (1) If your LP is lower than your opponent’s: Reveal 3 Beast-Type monsters from your Deck that have 300 ATK and 100 DEF, your opponent chooses 1 for you to add to your hand, and you shuffle the rest back into your Deck. (1) Send to the Graveyard EITHER 1 “Spellbook” card (except “Spellbook of Galdrabók”) from your hand or field, OR 1 Spellcaster-Type monster you control, and if you send a card to the Graveyard this way, draw 2 cards. (1) Target 1 face-up monster on the field; for the rest of this turn, it loses ATK equal to its DEF. (1) Discard 2 cards, then target 1 Trap Card in your Graveyard; Set it to your field. That Set card can be activated during this turn. (1) Once per turn: You can target 1 Link Monster on the field; move that monster to one of its Link Points that is also a Main Monster Zone on its controller’s field. (2) Once per turn: You can move 2 Link Monsters in the same player’s Main Monster Zones (either yours or your opponent’s) to each other’s Main Monster Zone. (1) This effect is applied to both players. ● Cards in your Spell & Trap Zone in the same columns as monsters in your Main Monster Zone cannot be targeted by, or destroyed by, your opponent’s card effects. ● For the rest of this turn, monsters you control cannot be destroyed by battle. ● For the rest of this turn, battle damage you would take is reduced to 0. ● For the rest of this turn, each time a monster you control inflicts battle damage to your opponent, gain an equal amount of LP. (1) Banish your opponent’s entire hand, and if you do, they draw 1 card for each card banished from their hand by this effect. (2) You can banish this card from your Graveyard, then target 1 “Trickstar” monster in your Graveyard; Special Summon it. (1) If you control a Machine-Type monster: Change all Attack Position monsters your opponent currently controls (if any) to Defense Position, also, for the rest of this turn, if a monster(s) is Normal or Special Summoned to your opponent’s field, change that monster(s) to Defense Position. (1) If you control “Supreme King Z-ARC”: Destroy as many monsters you control as possible, except “Supreme King Z-ARC”, and if you do, Special Summon from your hand, Deck, Extra Deck, and/or Graveyard, up to 4 “Supreme King Servant Dragon” monsters with different names from each other, ignoring their Summoning conditions. (2) You can banish this card from your Graveyard, then target 1 “Supreme King Servant Dragon” Xyz Monster you control; choose 2 “Supreme King Servant Dragon” monsters that are either monsters in your Graveyard or are face-up Pendulum Monsters in your Extra Deck, and if you do, attach them to that target as Xyz Material. (1) Banish 1 “Starrelic” monster from your hand or face-up from your field, then target 2 monsters in your Graveyard; Special Summon them, but they cannot attack this turn. (1) If you control 2 or more “Lightsworn” monsters with the same Type as each other, but with different names from each other: You can banish 2 “Lightsworn” monsters from your Graveyard, then target 2 cards on the field; banish them. (2) If this card is sent from the Deck to the Graveyard by a “Lightsworn” monster effect: You can Special Summon 1 “Lightsworn” monster from your hand. (1) Target 1 face-up monster you control; banish any number of “Lightsworn” monsters from your Graveyard, and if you do, for the rest of this turn, the targeted monster gains 200 ATK and DEF for each. (2) If this card is sent from the Deck to the Graveyard by a “Lightsworn” monster effect: You can activate this effect; for the rest of this turn, “Lightsworn” monsters you control cannot be destroyed by battle or card effects. (1) When an opponent’s monster’s effect is activated, and you have 3 or more cards in your hand: You can target 1 “Dark World” monster on the field; return the targeted monster to the hand, and if you do, that opponent’s effect becomes “Discard 1 random card from your opponent’s hand”. (1) When a Link Monster is Link Summoned: Destroy all monsters on the field that are not in a Linked State. You cannot conduct a Battle Phase during the turn you activate this card. (1) Target up to 2 Spell/Trap Cards on the field; destroy them. (1) Target 1 monster in your Graveyard; Special Summon it in Defense Position. (1) When a monster effect is activated by your opponent: Your opponent draws 1 card, also negate the activation, and if you do, destroy it. (1) Roll a six-sided die twice and destroy all face-up monsters on the field with a Level/Rank lower than the combined result. (1) If a monster you control battles an opponent’s monster, during damage calculation: Play games of Rock-Paper-Scissors with your opponent a player loses one of those games, and make that player banish, face-down, their monster that is battling in this battle.